Handfasting is a commitment to marry at a future date. This article talks about the defintion of the word and the history of the custom. It also discusses the ceremony itself, and why it may be popular today. Obviously, the word “handfasting” comes from the combination of the words “hand” and “fasting”. The old English definition of the word “fæst” is “firmly fixed, steadfast, secure, enclosed.” Today we would probably use the word “fasten” in this context. If you put these two definitions together, it means “firmly securing of hands”. This Celtic tradition may date as far back as 7000 B.C. However, some debate whether the tradition goes back that far. Much more is known about how people used it in the Middle Ages. This is the time from roughly 500 to 1700 A. D.
During that time, it was a “betrothal” ceremony. A betrothal is a formal commitment to be married at a future date. A betrothal is in the future tense. For example, you may say “I will take you to be my husband” in a betrothal. In contrast, marriage is done in the present tense. For example, you may say “I do take you to be my husband” in a marriage ceremony. So, the idea is very similar to an engagement. After the handfasting period ended, a couple would marry. A betrothal was binding and not often broken. According to this article, experts believe that handfasting faded from use in Scotland in the late 17th century. The book The Monestary (1820) by Sir Walter Scott discusses handfasting in the past tense. This indicates people did not practice the custom during his time. Later, at some point in the late 18th century, people revived the idea of handfasting. The belief arose that it was a period that would last one year and one day. However, that belief was probably incorrect. During this time it was a more secular ceremony and less binding than in prior times. 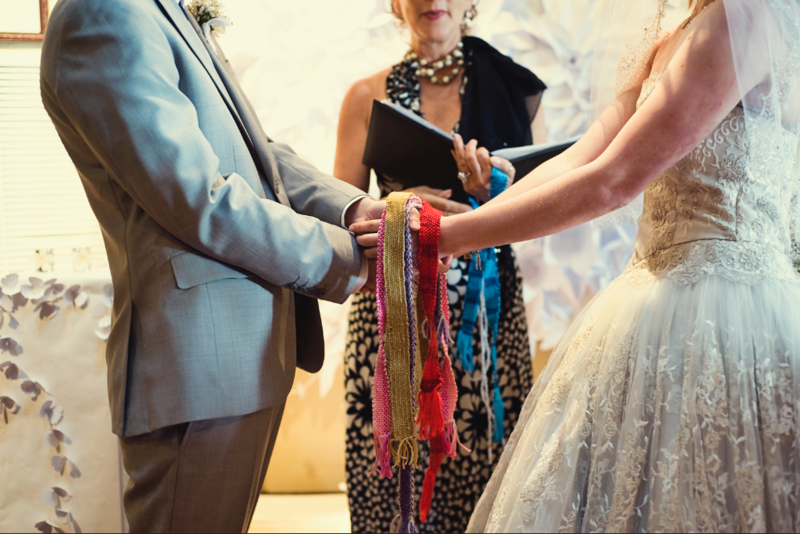 Finally, from about the 1960s to today, people revived handfasting again. Today handfasting describes Neopagan ceremonies. Like before, people use them to form temporary unions or permanent marriages. Today, typically a Priest or Priestess will perform the ceremony. Ceremonies are typically done outdoors. It can be an official marriage if accompanied with a state marriage certification. The ceremony can vary and there are no set vows. Often, the couple will write their own vows. However, there are some traditions common to most ceremonies. You’ll find color meanings similar to these on this page and this page. As far as I can tell, the definitions listed above are common, but there is no consensus. Why Is It Popular Today? The internet has increased interest in genealogy. So there is more interest in old traditions. There is a trend toward reviving old customs like this. Since around 1970, a couple popular books and film may have helped revive handfasting again. In 1970, The Doors’ lead singer Jim Morrison married Patricia Kenneally in a handfasting ceremony. Morrison’s biography No One Here Gets Out Alive (1980) mentions it. It also appears in the 1991 film The Doors. In the film, Patricia Kennealy-Morrison plays the role of the priestess. Finally, in the 1995 movie Braveheart, William Wallace and his girlfriend Murron marry in a handfasting ceremony (pictured below). Many thanks to Dan Foley for asking me to contribute this piece to his website. My goal here is for you, the reader, to gain a clear understanding of the thing we call “the golden ratio.” This is a topic on which many people have opinions, ranging from mystical adoration to scientific disdain. My own view falls into neither extreme. I must ask for your indulgence as my effort to clarify the topic requires me to raise some important issues prior to getting into its actual description and possible meaning. It’s impossible to talk about a mathematical concept without math; however, I have tried to hold it to a bare minimum. My own serious interest in the golden ratio began as a child with a moment that was clearly poignant enough for me to recollect. Please join me as we begin this story quite a while ago in another country. Herr Finke stared at me, quite possibly lost for words, and I stood there in place, slowly realizing that my statement had not raised my standing with him the least little bit. I began to suspect that I might just have said something incredibly stupid and possibly even offensive to him. 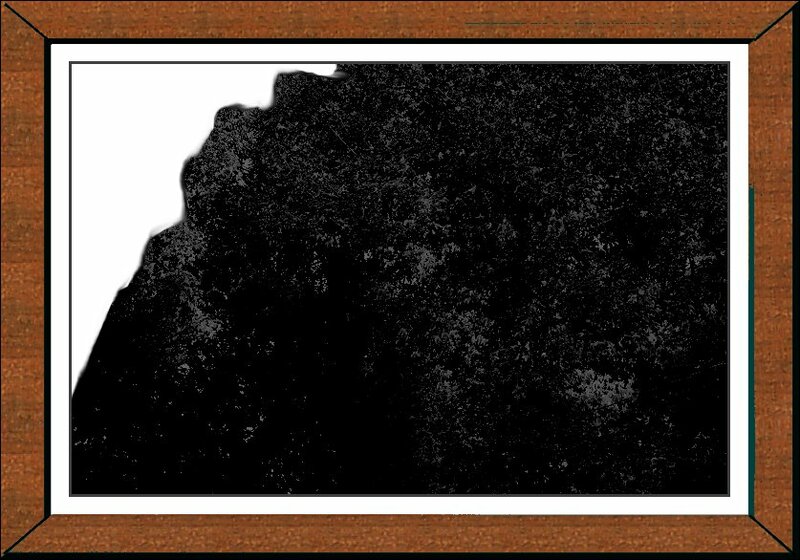 Clearly, there was not even a hint of any ratio, golden or otherwise, to be seen in that piece of tar paper. There were some torn edges and some slight variations of black and gray, but that was all. What’s more, I should have remembered that Herr Finke took a rather dim view of the association of numbers with art. From time to time, he had all of us thirty or so boys in the class stand and recite in unison: “Mathematical regularity is the death of art.” We complied of course—with mathematical regularity. Now, in retrospect, more than half a century later, I am imagining what the finished display might have looked like, and I am asking myself if it even makes sense to connect beauty with a torn piece of tar paper. I must confess that I’m disinclined to think so. It may have been an interesting and thought-provoking display on his wall, but probably not beautiful. Please keep in mind that a work of art need not be beautiful in order to be great. Does anyone find Picasso’s Guernica to be “beautiful”? I, for one, do not; “beautiful” is not the appropriate word. It may even be just plain wrong to find beauty in what Picasso had deliberately created to illustrate the hideousness caused by the bombing of the Spanish town Guernica. Still, it is a truly profound masterpiece. Original at Museo Reina Sofia, Madrid. “Wait a minute!” I can hear someone calling. “Isn’t beauty in the eye of the beholder?” This is a good question, still worth considering centuries after it was first brought up, but it needs a little refinement. There are two valid answers to this question, depending on how you interpret it. The second answer comes in two parts. The second answer is best put in the form of a counter-question: If beauty does include the “eyes of the beholder,” is that all there is to it? Does the mere “feeling” that something is beautiful exhaust its meaning? Frequently, when people say that “beauty is in the eye of the beholder,” what they mean is that there is nothing more to beauty than whatever a person happens to consider beautiful. They do not allow for any objective standards whatever. If someone finds a melody beautiful, then it is beautiful—for him. If someone else finds the same tune distressing, then it is not beautiful—for her. So, in that case, there are no objective standards for beauty. Someone might ask, “Who’s to say that I must consider this picture to be beautiful?” It’s not easy to come up with a suitable reply to any “who’s-to-say” objection, mostly because it is not really a logical argument. People who talk in this manner are usually trying to avoid making a rational case for their point of view. Still, even if we ignore the folks who wish to deny any standards for beauty on ideological grounds, we can’t ignore the fact people do have disagreements on what they consider to be beautiful. Nevertheless, the gap is not a void. People also have a lot in common when it comes to recognizing beauty. I have traveled to a lot of cultures around the world and found beauty where I did not expect it as well as ugliness where I did not think it would be there. But there always was some shared understanding of what makes for beauty. We can find no two cultures anywhere that have entirely opposite notions of beauty. We also need to take into account the reasons why some cultures may display repulsive-looking items in their houses or temples or where some people may display some strange body art. The reason is usually not that they have a bizarre sense of beauty, but that the item serves some practical purpose, e.g., that the ugliness will hopefully drive away evil spirits. So, let’s make use of a little bit of common sense and recognize that, despite many clear disagreements in judgment, there are certain pieces of art that a very large number of persons would accept as beautiful, and some others that simply will not qualify for an overwhelming majority of human beings. If the beauty of a piece of art is not entirely a matter of a subjective impressions, we must raise another question. Are there any means by which we can decide whether an item qualifies as beautiful? As always, a carefully thought-out answer will be best. If the question is intended to expose some unalterable requirements that are essential to beauty, we may be asking for too much. However, we can take an inductive approach and look at many beautiful pieces of art. Then, if we find that they seem to share certain factors, we may be able to arrive at a more modest, but also helpful, answer. There are numerous theories on the nature of beauty. Since we are heading into one particular direction, namely the golden ratio, let us simply stipulate that there are many qualities that may contribute to the beauty of a work, and that these qualities may differ to some extent from case to case. For example, when we say that a sunset is beautiful, we are most likely thinking of something glowing crimson red with orange streaks and filling the entire horizon. Those attributes, I will insist, are not what makes a woman beautiful. Among the factors that are frequently brought up as instilling beauty in a work of art, are some that relate to numbers, usually under the heading of “proportion.” For example, we often look for symmetry in pictures as a sign of beauty; viz. an imaginary axis would divide the item into two similar or balanced halves. Then, with a nod to Herr Finke, an item deliberately added to disrupt the outside of the symmetry will draw the viewer’s eye to a particular spot so as to keep the picture from becoming boring. I have tried to illustrate this point in my drawing of the Buddhist saint Theri Kisa Gotami. Then there is this other, more complex, mathematical ratio that many people associate with beauty, which has been called the “golden ratio” for the last few hundred years. Many people believe that a work of art is particularly beautiful if it exhibits that proportion. We will take a close look at it as this web site proceeds. A good example of how some people view the golden ratio is evident in how they reacted a little while ago when someone recognized that one of Michelangelo’s pictures in the Sistine Chapel (see below) exhibited the golden ratio. “We always knew that it was beautiful,” someone said, “now we know why.” According to their understanding, the golden ratio actually causes us to see beauty in a work of art, even when we we’re not aware of it. The golden ratio, which we associate with beauty in art and nature, actually had its origin in geometry. You may remember taking a course in geometry in high school, and I wouldn’t be surprised if your recollections of it are somewhat dull and gray: drawing squares, rectangles, and circles with only a compass and straight edge, proving that two triangles are similar by relying on axioms and a never-ending list of theorems, figuring out that if angle a = angle β, then line AB must equal line CD—dreary stuff that seems millions of miles removed from the world of colorful paintings and the splendor of the buildings of antiquity. Still, that’s where it started. Euclid of Alexandria, who lived in the Greek-speaking world of the 3rd century BC, has been the binding authority on geometry in the form that you may have studied it. (Nowadays there are also non-Euclidean versions of geometry, but they don’t usually show up in high school courses.) He reported on some interesting results when he looked at a pentagon, the geometric figure with five equal sides. When he drew straight lines from two adjacent points of the pentagon to a single point directly opposite, he had created a triangle. (3) the sum of the base and one of the sides b+s. Looking at the triangle it is quite obvious that s, the leg, is longer than b, the base. Also, if the rules of math mean anything, then the length of the side and the base together (b+s) must be larger than b or s by themselves (unless one or the other were equal or less than 0, which is impossible). Please understand that I am talking about only one specific triangle. What I’m describing here applies only to the triangle that Euclid discovered in the Pentagon. The crucial question is now: What are the relationships between the lengths of b, s, and b+s? We can actually find some specific numerical values for the ratios between these lengths. I’ll skip the equations and just share the numbers with you. We can look at the proportion of the larger segment s to the base b, and we come up with a particular number, namely 1.618033…, where the three dots indicate that this decimal never comes to an end, no matter for how many places you calculate it. They both come out to the identical number! So, the proportion of the sum of the base and one side to the long side is equal to the proportion of the long side to the base. It might be appropriate here to mention that, despite its millennia-long existence, this proportion was not called “golden” until the German mathematician Martin Ohm (1792-1872) did so. Now, using the terminology retroactively, we call this triangle the “golden triangle,” and the line as, well, a line representing the golden ratio. We can also draw a golden rectangle. 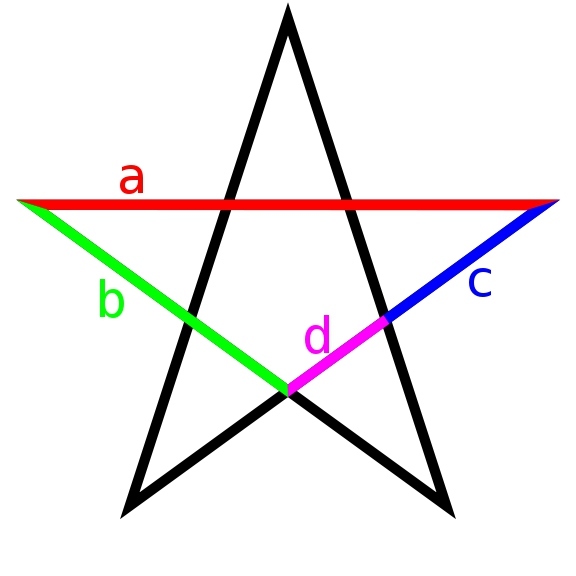 We use the same proportions as for the triangle, except that we come up with a figure for which the long side (a) and the short side (b) have the same proportion as the sum of both (a+b) to the long side (a). Furthermore, with yet another mathematical formula, you run a curved line connecting square to square and wind up with a “golden spiral,” which has its own properties. Starting from the largest square, it will look quite loose, but then it tightens quickly as it continues into the fields of decreasing size. For the sake of contrast, compare this spiral with, say, a tightly wound coil of garden hose. When one looks at a golden rectangle, the center of the spiral (which is not the center of the rectangle) provides a natural focal point for the eye. Since I can’t possibly draw a logarithmic spiral with sufficient mathematical regularity to do it justice, I’m going to rely on Wolfram Alpha’s diagram. I animated it so that we can watch it develop, curling and uncurling. I promised to come back to the number phi (ϕ) and tell you some interesting things about it. Let’s start by looking at the number itself, and then at its relationship to some other numbers. Most numbers don’t have any names, other than reciting its numerals insofar as we are able to do so. Phi finds itself in illustrious company with a few other numbers, such as pi, the number associated with circles. Originally, mathematicians gave it another Greek letter, tau (τ), probably because ϕ already had a common use in designating mathematical functions. However, phi was introduced instead to honor Phidias, the architect of the Greek temple called the Parthenon. Many people claim that the building incorporates the golden ratio, and, thus, the different designation became popular. I shall limit myself to bringing up just four of its most obvious and impressive attributes. As I mentioned already, there is a mathematical formula by which we can derive a numerical value for phi. Since phi is not a measurement but a ratio, it will always be the same. a number that may not mean anything to you at first. But if you look it up, you’ll find that it just happens to be exactly the square root of 5 (√5). Even though this fact may be surprising when you first hear about it, you should know that √5 already comes up in the formula for calculating phi, so there’s no need to invoke some kind of mystical power for it. the same digits once more. exactly one more than it was before you squared it. These peculiarities are not true of any other numbers. I would like to return to the theme of “beauty” here for a moment. 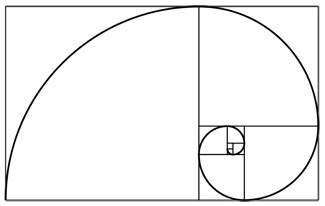 As mentioned, a lot of people are convinced that the presence of the golden ratio contributes to the beauty of an item. However, I think it is also a good idea to look at a number like phi and admire the beauty within it simply as a marvelous number apart from its implementation. What intrigues most people about phi is its relationship to a particular set of numbers, devised by a medieval mathematician, sometimes known as Leonardo of Pisa, who usually goes by the name of Fibonacci. The numerical series he came up with frequently overshadows the greatest contribution he made to Western civilization, something that affects all of us, namely the formal introduction of the Indian/Arabic set of numerals to replace the Roman ones. No longer did people have to write, let us say, “LXXXVII,” but they could simply write “87.” Can you imagine doing long division with Roman numerals? E.g., can you divide MMXLVIII by CXXVIII? Of course, you can, but not by setting up your division with Roman numerals. The answer is XVI, and the only way you can arrive at it is by either translating the Roman numerals into Indian/Arab ones or at least thinking it through in words by imagining modern numerals. Still, if you hear Fibonacci’s name mentioned, it’s probably in the context of the series of numbers he generated on the basis of a little mind experiment. Fibonacci proposed that there is a man who had one pair of rabbits in his yard. Rabbits, as everyone knows, reproduce and multiply quickly, and these particular rabbits follow an exact pattern in doing so. Each pair reproduces a new pair each month; however, a new pair is too immature to do so in its first month of life, and can only contribute a new pair in its second month of existence. Fibonacci asked the question: How many pairs of rabbits, will the man have after a year? Let’s calculate to find the answer. We start out with just one pair of rabbits, but they are ready to do their part to comply with the rabbit’s prime directive. For the second month, there is an immature pair of rabbits waiting to grow up, and so we still have only one mature pair. By the third month, the new pair’s off-spring has matured to be counted, and there is a new immature pairs, courtesy of the original pair, waiting to reach adulthood. When we get through the fourth month, There are now three mature pairs, and the first two pairs will have produced another immature pair. Let’s move on to the fifth month. You may start to detect a pattern on how to calculate the number of mature pairs for each subsequent month, but I won’t tell you yet to give you a chance to figure it out. I’m also going to add another column to the right. It will give you the number you get when you divide that month’s number by that of the previous month. Okay, I think you’ve probably figure out what we’re doing here. For each month, the number of rabbits is the sum of the two previous months. 1+0=1; 1+1=2; 1+2=3; 3+2=5. So, we can go on and fill out the table, by keeping up this simple exercise in arithmetic: 5+3=8; “8” will be the entry for the sixth month. 8+5=13 will give us what we need for month 7, and so forth. I am now going to fill in the entire table for one year. In order to avoid clutter, I’m dropping the immature rabbits (so to speak) While you’re checking up on my addition, you may also want to glance at the right-hand column of ratios, and figure out what is happening there, if you don’t know already. The last row gives us the answer to Fibonacci’s puzzle: At the end of the year, assuming the rabbits have followed the plan with precision, the man will have 144 pairs of mature rabbits. These numbers are known as the Fibonacci series or Fibonacci numbers. As indicated you get them by starting with 1, adding 1, and from then on adding the two previous numbers to get the next one: 1, 1, 2, 3, 5, 8, 13, 21, 34, 55, 89, 144, 233, 377, 610, and so forth. But what about the numbers in the far-right column, the ratios of the present number to the previous one? I have a strong hunch that you have your own strong hunch about what’s going on there. In fact, I’m pretty sure that you already know. Just to confirm your expectation, let me list the first 20 Fibonacci numbers, each one with the ratio to its predecessor. Do you see what’s going on? Of course, you do. The further we go down the line, the closer we get to phi, the number of the golden ratio. Here, by the twentieth number, we have already reached the approximate digits we used above (1.618033…), but if we extend phi by a few more digits, 1.61803398874989…, we see that we have not yet arrived. And we never will, because the digits never come to a stop, and, thus, the Fibonacci numbers will never totally attain complete equality with phi. Please understand that we didn’t derive phi from the Fibonaccis. But the ratios certainly come closer and closer to phi, alternating between a little too high and a little too low. A mathematician might say that as the Fibonacci numbers approach the limit of infinity they converge to phi. This observation on the relationship between phi and the Fibonacci numbers has opened up new vistas in observing the world around us. Where the Fibonaccis are, phi can’t be too far away. And where we can discover phi, the golden ratio must be right around the corner. One of the most intriguing features of the Fibonaccis is that they appear in aspects of nature that don’t have anything in common with each other. How many petals does a flower have? Of course, that number varies from species to species, but if you have to guess, you’re best off ignoring any numbers that are not found in the Fibonacci series. If you measure the bones in your fingers, they are supposed to be in a golden proportion to each other. Male bees (drones) do not have “fathers.” They are born from unfertilized eggs of the queen bee. Of course, each queen, being female does have a drone for a father. Thus tracing the genealogy of any given drone, may sound a little complex–until you realize that the numbers of any generation are follow the Fibonacci numbers. In my diagram below, the queens are designated by their purple “skirts.” Regular worker bees are female with both a mother and father, but they do not reproduce, so they do not figure into this scheme. According some scientists, certain galaxies form spirals with arms, which follow the pattern of the golden spiral. However, as interesting as these phenomena are, I need to continue to focus on the visual arts. This section considers the application of the golden ratio to the visual arts. The most common examples come from ancient architecture and various painters. I’m going to mention some examples and let you, the reader, decide in a number of cases whether there is sufficient reason to believe that the golden ratio is present and contributing to its beauty. It was an Italian mathematician named Fra Luca Pacioli (1447-1517, almost two thousand years after Euclid) who spearheaded the idea that there was something unique and spiritual about the golden ratio. Up until his time, it had lived under the vanilla appellation of “the proportion of the mean to the extreme.” Pacioli called it “the divine proportion” and saw it as a manifestation of God’s glory in creation. He developed this notion in a three-volume work, and a close acquaintance of his drew the illustrations for it. That artist was none other than Leonardo da Vinci. This collaboration is important for the history of the golden ratio because it leaves no doubt that at least from this time on at least some artists knew about the golden ratio. If we find it in their works, there’s a good chance that it’s there intentionally. They may even have done so on the basis of Pacioli’s doctrine that the golden ratio instills beauty in a work in art due to its spiritual origin. To the best of my knowledge, even though Euclid’s book was, of course, well known and had been studied for a long time, it was not until the time of Pacioli that the notion of the golden ratio as the bearer of beauty really became popular. Nevertheless, today many people advance claims that it was embodied in the architecture of ancient times, even predating Euclid. For example, as mentioned earlier, the Parthenon in Athens has become the example par excellence for this idea. Phidias (480-430? BC), its architect, lived roughly two hundred years before Euclid. Once again, an argument like “Who’s to say that they didn’t have it and just kept it a secret?” is still a block of wood against which one cannot fence. … we can see the golden ratio in what remains of the buildings today. Unfortunately, in quite a few cases we know nothing of the builders or what they may have known or intended, and the presence of the ratio appears to be supported only by some arbitrary measurements. There may be one or more buildings for which a large number of people claim that it embodies the golden ratio. However, if asked to show exactly where it is, they may draw significantly different lines, some of which may not even have much to do with the golden ratio. In that case, the claim may not be all that plausible. My main purpose here is to provide an introduction to the golden ratio rather than a critique of its application, and, so, I will leave it up to you whether you believe that the golden ratio is incorporated into various famous buildings. The list of candidates includes the ancient pyramids of Egypt, the Parthenon, the Taj Mahal, Notre Dame Cathedral, The U.N. Building, and many others; quite a few of them are controversial. Happy hunting and measuring! However, I would like to point out some artistic productions that appear to meet the criteria mentioned above. For example, I mentioned already that Leonardo da Vinci was the illustrator for Fra Pacioli’s book on the “divine ratio.” So, it is not surprising that when he painted the Mona Lisa that her face could be inscribed by a golden rectangle. The face can be circumscribed by a golden rectangle. There are other ways in which various people have sought to find the golden ratio in this and other works of his. I am not as convinced by those as I am by this straightforward example. Very early on I made reference to a painting by Michelangelo. He is, of course, very well known for his sculptures; his best-known work in paint is undoubtedly the ceiling of the Sistine chapel. It is divided into various panels, and the most famous among those may very well be the one referred to as “the creation of Adam.” We see God, represented as a Zeus-like figure stretching out his finger to touch Adam’s finger, thereby giving him divine life. Now look at the picture below. Let us draw an imaginary straight line from the edges of the panel that will cross the spot where the fingers meet. Or, for that matter, draw a real one, but use a reproduction please, not the original! Theoretically, you can divide up any line into golden ratio segments; thus, there is no good reason why we couldn’t do it here. So, now take that line and divide it up into golden ratio proportions with the shorter segment corresponding to Adam’s side and the longer one to God’s. segments right where the two fingers meet. Now you can see what all of the excitement is about. The two segments meet at the very point where God’s and Adam’s fingers meet. Michelangelo has celebrated this miracle, the creation of life, by including golden ratio proportions for his depiction. Gary Meissner has pointed out some inaccuracies in the original report, though, as well as some relating some further information, which is more accurate. One more painting. Salvador Dali is a twentieth-century painter. For most of us, what comes to mind when we hear his name are his depictions of our supposed subconscious world, such as the famous “Persistence of Memory” and its drooping watches. However, he drew himself away from this style, called surrealism, and in some of his later paintings he very intentionally incorporated (much to Herr Finke’s chagrin, I’m sure) mathematical regularity. His famous picture of the “Last Supper” has the measurements of a golden rectangle. Furthermore, so as to leave no doubt about the matter, encasing Jesus and the disciples at the table is a dodecahedron, a three-dimensional object with twelve faces. Each of those faces has the shape of a pentagon–the shape that marked the original birth of the golden ratio. Also, for what it’s worth, this is the shape of the traditional soccer ball; the strong air pressure makes the pentagons bend outwards so it can roll. Please find other pictures that may incorporate the golden ratio. You also might want to think about what it is about a particular picture that makes it beautiful if it’s not the golden ratio. Oh my, I’m glad I brought up that subject in the last sentence. I almost forgot to address the most important issue of this whole subject, namely, whether the presence of the golden ratio actually triggers a reaction in us to see an item as beautiful. Some people subscribe to the idea that certain numbers have mystical or magical powers, though which ones are auspicious and which ones are not varies from culture to culture. We call this way of thinking numerology, and when I’m thinking about the nature of phi and the golden ratio, that’s not what I have in mind. I do believe that God created a world filled with beauty and that his creation includes numbers, which manifest a beauty all their own. If we believe in divine creation of numbers, clearly God also created phi and the golden ratio. But whether he did so in order to allow us to see even greater beauty is not easily settled. Here, as in other places, we need to rely on scientific investigations to learn more about God’s creation. The best answer I can give to the question is that it has not received a final answer. There are extremes on both sides of the question, and my advice would be to distrust anyone who speaks or writes on the matter in absolute terms. (Keep in mind that someone who is really sure about an issue should have no problem discussing the topic and trying to see the other side of it.) Over the course of the twentieth century various psychologists have attempted to set up experiments to see whether people are unconsciously drawn to items in the golden ratio, such as a golden rectangle vs. rectangle in different proportions. It’s not easy to set up such an experiment so as to produce scientifically valid results. Nor is it easy for the human eye to distinguish a golden rectangle from others that are close to it in their proportions. Keep in mind that phi is a totally different number from fractions that consist of whole numbers in their numerators and denominators. 4/3 (1.33), 3/2 (1.5), 8/5 (1.6), 5/3 (1.67), and 7/4 (1.75) are not just different in the values, but also in their very natures. Phi cannot be written as a fraction of two whole numbers. For practical purposes, it appears that the ratio of 1.6/1 as opposed to the more exact 1.61803…/1 is close enough in the real world, not to matter much. In the theoretical world, however, it should matter. The claim is not that we are drawn to 1 plus a fraction, but to the specific number embodied in the golden ratio. Mario Livio reports that the studies that have been done with the greatest amount of scientific objectivity do not support an outright preference for phi over orther ratios, but that, on the whole, people like a proportion somewhere in the vicinity of 1.6:1. My own, totally informal and non-scientific questionaires have come to the same conclusion. In fact, let’s close this lengthy discussion with a little test to which we should not ascribe a whole lot of scientific worth. I’m going to present you with a number of pictures in different proportions, and let you choose which one is the most appealing to you. The proportions are the five alternatives mentioned above and one with the golden ratio. It is not not possible for me to set up pictures in fractions of pixels, so I have had to limit myself to rounding down the second decimal (hundreths). If you send me your guess at my e-mail address, I’ll write you back and tell you what the actual dimensions are and whether you picked the one with the golden ratio. Which of these pictures is the most beautiful or attractive? ConclusionFeel free to undertake measurements if you know of a way to do so, but why not wait until you’ve decided on your preferences and sent in your form if you’re inclined to do so? My basic nature is altogether too close to that of the proverbial cat, whose desire to learn could not be quenched and, thus, eventually led to his untimely demise. Happily, so far I have avoided that fate, though it has not come entirely without cost. I would love to be able to sit down with Herr Finke and discuss theories of art with him as adults. I have avoided giving you a description of him up to now, and it would be interesting to see how you pictured in your mind what a German avant-garde art teacher might look like. He was a relatively young man, probably in his early thirties, fairly tall, with reddish hair that anticipated the “Beatle” haircuts of several years later. I remember him as wearing clothes that were somewhat loud and clashing for his day, particularly for a school teacher. His very prominent adam’s apple smoothly slipped up and down his neck as he talked. During my last year in Germany, he was making plans of moving to Spain and pursuing a full-time career as artist. If we could have a conversation, I would listen carefully to what he was saying and, if appropriate, share my own conclusions with him. I would suggest that mathematical regularity per se neither kills nor contributes to art. Numbers by themselves are a beautiful part of creation, but they do not have any intrinsic powers. A beautiful work may, indeed, embody the golden ratio and, possibly, the beauty of the item may be enhanced by it. But numbers by themselves do not cause beauty, nor, for that matter, does the absence of numbers. 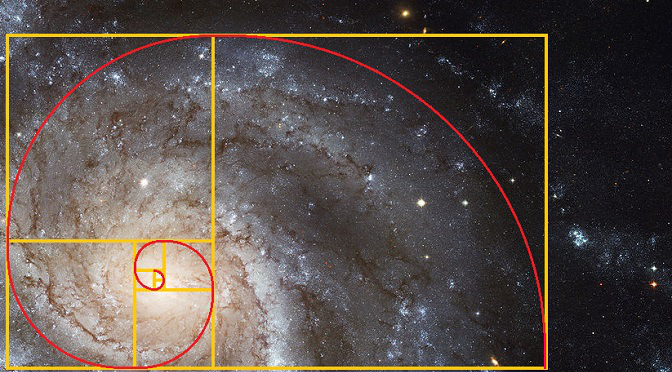 The presence in the universe of such things as a golden ratio gives evidence to us that behind the universe there is a Creator who built a world that contains both an amazing mathematical regularity and the capacity to astonish us over and over again with its beauty. 1. I noticed on the internet that there are one or more other artists with the surname of “Finke.” None of these are the gentleman in this account. Back to the text. Mario Livio, The Golden Ratio: The Story of Phi, the World’s Most Astonishing Number (New York: Broadway Books, 2002). Even WolframAlpha cites him for information. Obviously, a lot of the facts that he covers are general knowledge. Still, he put them together in a reader-friendly way with enough math to make you think and enough examples to keep you interested. Speaking of WolframAlpha, this is a website that is a companion to the original Mathematica program. It is a sophisticated math calculator with lots of explanations, as well as a source for information not directly tied to mathematics. One of the best websites on the golden ratio—wait, no, the best—-website on the golden ratio is hosted by Gary Meissner, who calls himself “The Phi Guy.” http://www.goldennumber.net/ He is definitely a “Golden Ratio Enthusiast,” but his enthusiasm is not uncritical. If you’re looking for a positive and trustworthy source on the web, I recommend him. Obviously, I can’t vouch for his accuracy in everything he addresses, but I haven’t caught him fudging anything yet, a rare delight in looking a golden ratio websites. And that thought brings me to mention my own website on phi that I put together out of a lengthy series of blog entries. It’s called The Golden Ratio and Phi–Let’s get them right. This site has a specific purpose in the context of Christian apologetics and contains a whole lot more math and critical approaches than this piece. I recently designed three new pendants, each with a different inspiration. 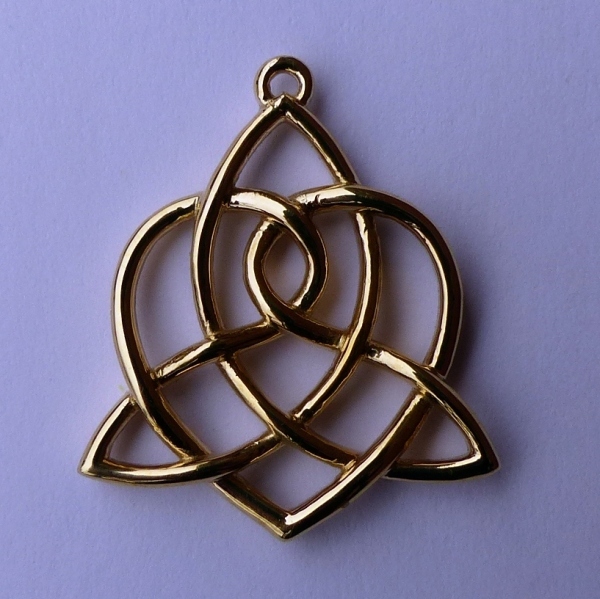 The Celtic Sisters’ Knot is one that I’d been meaning to do for a long time. 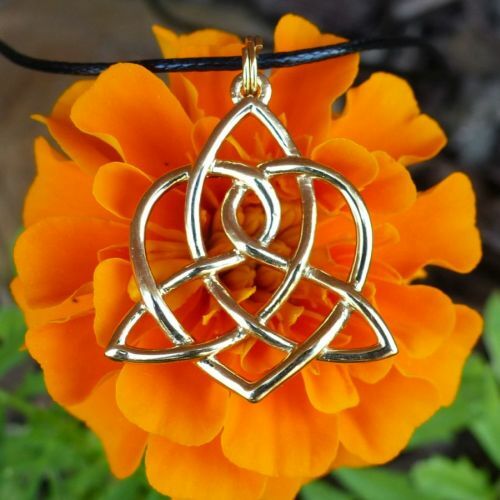 My most popular pendants seem to be ones that symbolize family in one way or another, such as the Motherhood Knot, Father’s Knot, and Mother and Child Knot. This is my version of this knot. This was inspired from various tattoos I have seen, and also from the Dropkick Murphys album cover Signed and Sealed In Blood. I really liked the image of a bleeding rose and wanted to understand what it meant. Obviously, the rose is a symbol of love. Some would say that a bleeding rose is supposed to symbolize the idea that love can outlive death. This idea goes way back actually, all the way to Greek mythology. The rose was a symbol associated with Aphrodite, who was often depicted wearing them. Adonis was her lover. There is a legend that a rose bush grew where he died and his blood had spilled, and that before that roses were white and not red. The Celtic Knot around the border of the shield is also another reference to this idea – two loops are intertwined and don’t have a beginning or an end. Celtic art and Celtic knots often border on goth style in a lot of cases. This one is probably the most goth design I’ve ever done. 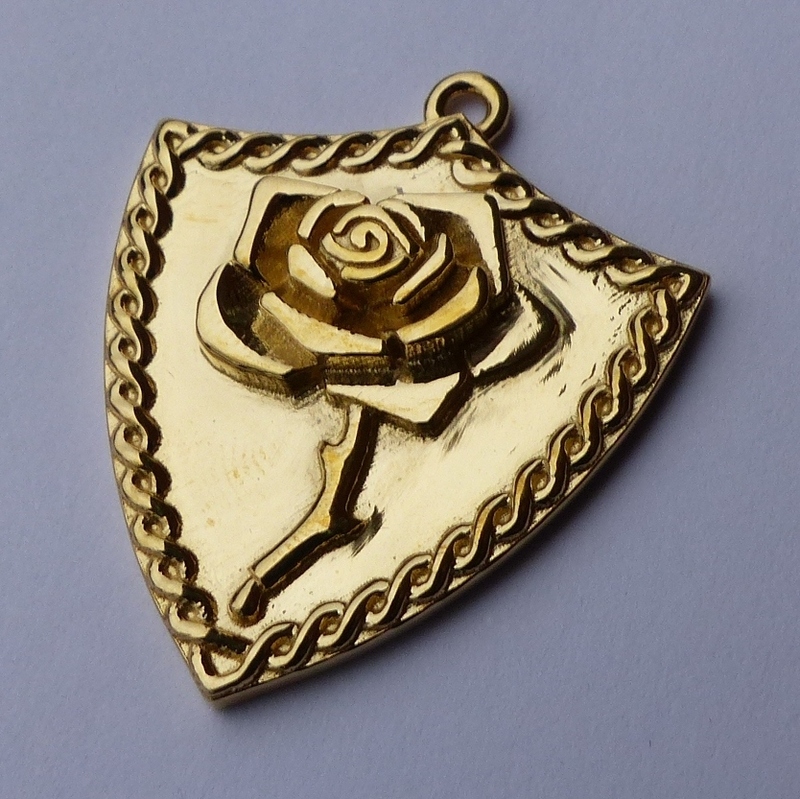 It took a long time to figure out how to make the rose intricate enough to be somewhat realistic, but also robust enough that it could actually be 3D printed. 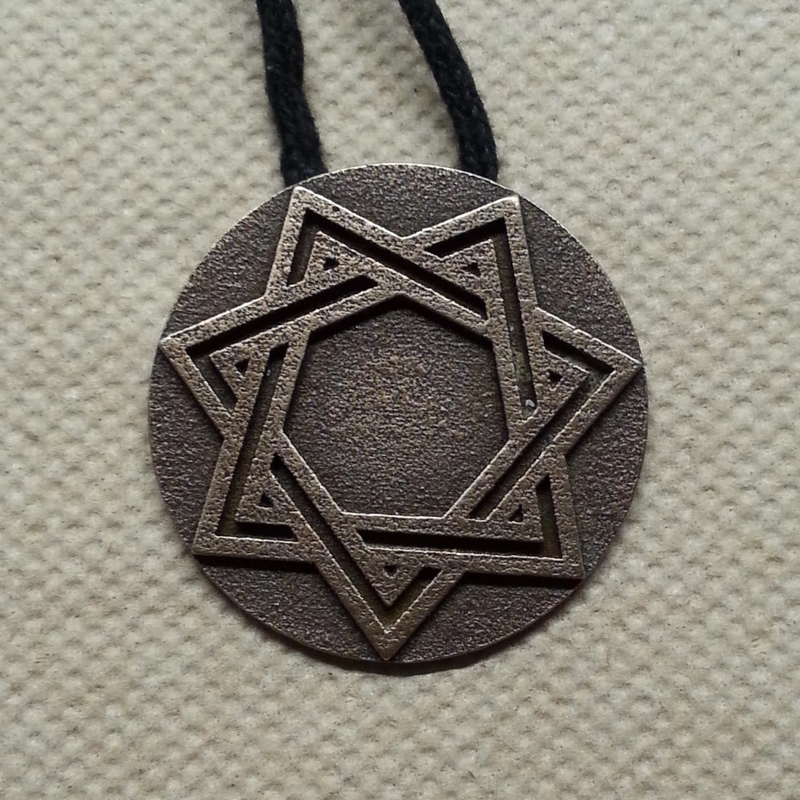 Recently, someone asked me to create some pendants of the septagram symbol. This piqued my interest. I became curious about the meaning behind the septagram symbol. Keep in mind that some may refer to the septagram as a heptagram. You will find in all of the sections below that the septagram represents groups of seven. It often represents completeness or wholeness. As you may already know, the number seven is used many times throughout the Bible. In most contexts the number seven represents completeness or wholeness. It can mean both physical or spiritual wholeness. The seven gifts are wisdom, understanding, counsel, might, knowledge, fear of the Lord and delight in the fear of the Lord. Less pleasant to think about are the seven deadly sins. Those are lust, gluttony, greed, laziness, wrath, envy and pride. Some believe Revelations 16 says that seven plagues will herald the end times. For centuries, astronomers knew of only seven other planets than Earth. They were called “wandering stars”. They were: Sun, Moon, Jupiter, Venus, Saturn, Mercury and Mars. The Sun and Moon occasionally were eclipsed. Also, the Moon would go through phases. The other five “wandering stars” were a lot more distant. All of the normal stars moved in a straight arc every night. The five “wandering stars” appeared in different places every night, and did not move in an even arc like the others. Their position relative to Earth changed as they went around the Sun. Because there were seven known planets, the number seven and the septagram became another symbol of the completeness of the Universe. The names of the days of the week also come from these seven original planets. Modern pagans adopted the septagram as their symbol. It is sometimes called the “Elven Star”. Finally, some believe it represents seven directions – North, South, East, West, Above, Below, and Within. Before I read about this, I thought that Alchemy was about trying to convert common metals into valuable metals. The classic example is the attempt to turn lead into gold. That is known as physical alchemy. However, there is a belief that the same steps of Alchemy can apply to a spiritual transformation for a person, known as Spiritual Alchemy. This is by far the most interesting meaning to me. Calcination – The alchemist burns the material to ashes. This breaks it down to a uniform state of decomposition. Dissolution – The alchemist dissolved the ashes in water in this step. Separation – The alchemist filtered the material and discarded any undesirable material. Conjunction – The alchemist combined the leftover materials into a new substance. Fermentation – The alchemist introduced yeast or bacteria to convert sugars to acids, gases or alcohol. Distillation – The alchemist boiled the solution to increase its’ purity and potency. Coagulation – The is the precipitate or sublimation to solid form of the purified result of distillation. This solid was called the philosopher’s stone. This was the legendary stone that could turn lead into gold. Calcination – A person reaches a low point due to personal loss or suffering. This creates a need to undergo a spiritual transformation. Dissolution – The person breaks down internal barriers and reveals buried problems or burdens. Separation – The person discards problems and burdens and gets back to their true essences. Conjunction – The person recombines the essences into new belief system. For example, the person could combine masculine and feminine sides, or conscious and subconscious. Fermentation – The person goes through a process to become inspired. They could use prayer or meditation to achieve this. Distillation – The person goes through another cleansing process. The intent is to make sure no remnants of the problems or burdens are carried forward to the final stage. Coagulation – The individual unifies mind, spirit and body into a state of enlightenment. Also, some call the process of alchemy Magnum Opus. There are four main stages. However, people often expand these to more stages, such as the seven described above. Occasionally, heraldry uses the septagram symbol. Anything from flags to uniforms can use the septagram. One example is the Flag of Cherokee Nation. Coat of Arms, family crests, and other similar symbols sometimes use the septagram. A few police forces use a septagram shape for their badge. Some people researched why many police forces use stars as badges. It doesn’t sound like there was much reason behind it. The main reason so many chose a star as a police symbol was because it was simple and fairly easy to make. UPDATE 8/25/2016: I have corrected an error in this post. I was careless in saying that the Golden Ratio, Phi, came from the Fibonacci Series. The Golden Ratio is the solution to the equation (a+b)/b = a/b = Phi. The Fibonacci series is one series of numbers that converges on Phi. So they are two unrelated concepts that happen to converge on the same number. I regret the error. I also added a caveat regarding confirmation bias to the section about how Phi is found in art and nature. Some of these claims are in dispute, but I still present them anyway as food for thought. I personally find some of them quite interesting, if nothing else. 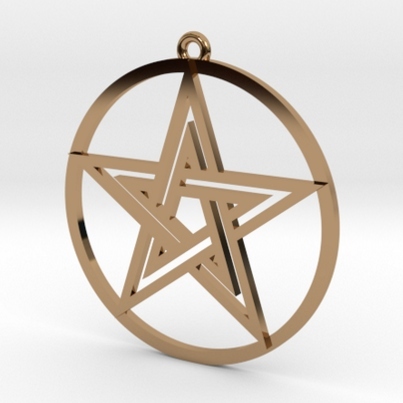 I was recently asked to design a Pentagram pendant from someone who found me through my Shapeways shop. I have of course seen the Pentagram many times. I was aware that the Pentagram was often used as a symbol by the occult and Satanists. So I deliberately avoided doing any designs of it or even related to it before now. It’s really unfortunate that such groups have decided to use it (although they normally use one that is upside down, not right-side up). Regardless, I was very pleased to learn the relationship of the Pentragram to the Golden Ratio, which is seen throughout nature and in many works of art. 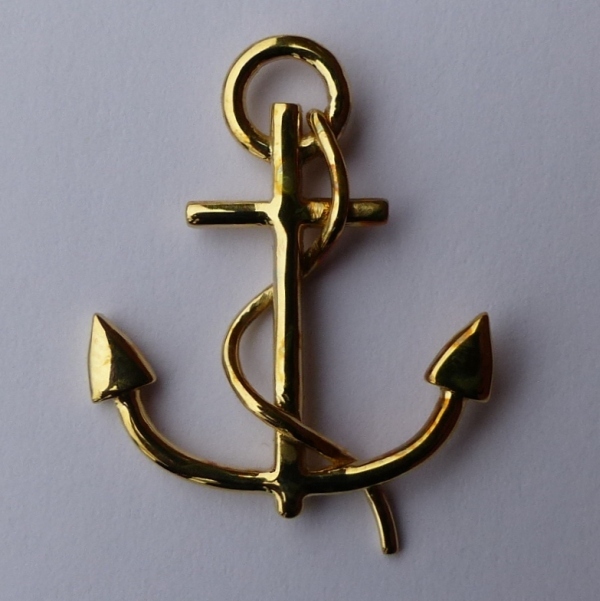 Let’s take back this amazing symbol and use it for better purposes. First of all, what is the Golden Ratio? The Golden Ratio is derived from solving the equation (a+b)/a = a/b. If you set the ratio a/b = Phi, the you get the equation 1 + (1/Phi) = Phi. When you solve this, you get Phi = (1 + √5)/2, which is 1.61803… Phi is another irrational number like Pi that goes on forever without a pattern. You can see 0+1=1 and 1+1=2 and 1+2=3 and 2+3=5 all the way to 89+144=233 and so on. As you go further and further out, the ratio of one number to the previous number starts to converge on Phi, which is 1.61803…For example, 233/144= 1.618055… It’s already starting to get pretty close. if you went further out in the series, you would get an even closer approximation of Phi. In geometry a “Golden Rectangle” is one where the length divided by the height has the ratio of Phi. How is the Pentagram Related to the Golden Ratio? First I will start this section with a disclaimer. Many of the examples below are disputed. The criticism is confirmation bias: when you start looking for the Golden Ratio, you start finding evidence of it everywhere. In fact, this phenomenon of finding the Golden Ratio everywhere has been hilariously mocked by the parody Twitter account Fibonacci Perfection. At the risk of being mocked, I still personally find some of these examples compelling and interesting enough to include in this blog post. To me, it sure appears that the distance between the pillars and outer edge of the dome follow the Golden Ratio. If you look closer there appear to be other distances that follow this ratio. Another example in architecture is the Parthenon, although that has been disputed. Some people say that features in the human face follows the Golden Ratio, and so we may find objects or art that display the Golden Ratio to be pleasing. 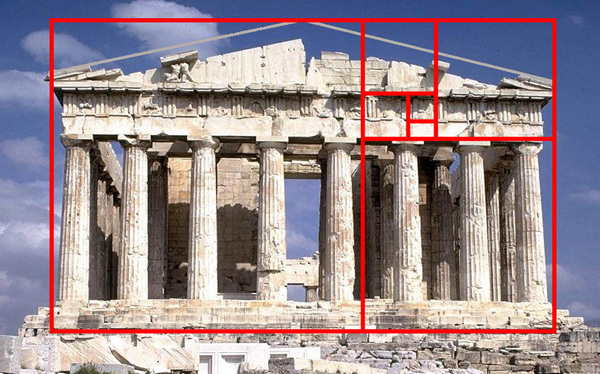 So even if the Greeks didn’t build the Parthenon to follow the Golden Ratio on purpose, maybe they designed it with similar dimensions because they thought it looked most appealing. In nature, there are many examples. I already mentioned the human face. Other features such as the length of each segment of your fingers, starting at your wrist follow this ratio. This is a neat article with a lot of examples. One that I found kind of mind-blowing was that many species of flowers have a number of petals found in the Fibonacci Series. The theory as to why so many features of plants would follow this ratio is that it has to do with the most efficient use of space. Plants have to efficiently use sunlight, so it would make sense that their leaves and other features would arrange to maximize their use of surface area. More famously are the examples of the Golden Spiral in nature. The hurricane, spiral galaxy and Nautilus sea shells are all examples of things that are Golden Spirals, or very close. So, what is the meaning of the Pentagram then? The Pentagram has a direct relationship with the Golden Ratio, and the Golden Ratio has a relationship with so many things found in nature. So to me, the Pentagram symbolizes this relationship between math and nature. No one knows why this symmetry exists in nature or why so many natural phenomenon would follow the Golden Ratio. The Pentagram also symbolizes this mystery. It’s an acknowledgment that there are forces at work which we don’t fully understand but can appreciate.